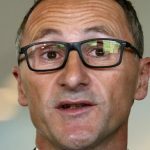 [By Dave Holmes] Greens leader Senator Richard Di Natale expressed his strong support for the embattled Peoples’ Democratic Party (HDP) in Turkey. The left-wing party has a strong base among the country’s oppressed Kurdish community. Speaking at a November 17 Kurdish solidarity meeting at Melbourne’s Trades Hall, Dr Di Natale condemned the current crackdown by the regime of Turkish president Recep Tayyip Erdogan. The HDP’s joint leaders, Selahattin Demirtas and Figen Yüksekdag, have been arrested along with a number of the party’s other MPs. Di Natale recalled the Greens long support for Kurdish self-determination in Turkey and the region. Greens leader Bob Brown opposed the original listing of the Kurdistan Workers Party (PKK) as a terrorist organisation by the Howard government in 2005. The Greens condemned the “anti-terror” raids on the Kurdish community in 2010. The Greens leader spoke of the Australian government’s complicity with the repressive policies of the Erdogan government. The situation for the Kurdish people in Turkey is dire. The news from earlier this month that the Erdogan regime has issued arrest warrants for all 59 MPs of the pro-Kurdish Democratic People’s Party is a worrying development and a sober reminder of the atrocities that the Kurds have for years suffered at the hands of the Turkish government. It is up to the international community, including Australia, to condemn the Turkish government’s actions and to fight for a better deal for the Kurds. I am pleased to stand with many members of the community, including the Australian Kurdish Association, against the Erdogan government’s crackdown on the Kurds and in support of the Kurdish people’s right to self-determination. I offer my support and sympathy to the Kurdish community in Australia and will continue to look for opportunities to raise this very serious issue in the Parliament. Organised by Australians for Kurdistan, the meeting was chaired by Moreland Socialist Alliance councillor Sue Bolton. The three key demands of the event were the call to drop the charges against Kurdish-Australian journalist Renas Lelikan who has been accused of membership of the banned Kurdistan Workers Party (PKK); lifting the ban on the PKK; and ending Australian complicity with the Turkish dictatorship. Basak Gel from the Kurdish Democratic Community Centre spoke of the pain the criminalisation of their legitimate aspirations had caused among Australian Kurds. The party many of them support is outlawed, they endured the Federal Police raids six years ago and now they have to deal with Lelikan’s prosecution. Civil liberties lawyer Jessie Smith, heading up the defence for Renas Lelikan, made an incisive contribution. She pointed out the contradiction between Australia’s participation in a supposed anti-terrorist coalition in Iraq and Syria and our government’s ban on the PKK and the harassment and persecution of its supporters. Colin Long, state secretary of the National Tertiary Education Union, reported that the next meeting of the Victorian Trades Hall Council will adopt a motion calling for the PKK to be removed from Australia’s list of terrorist organisation. He went on to draw attention to the dire effects the repression in Turkey was having on the hard-pressed labour movement in that country. Long ended by declaring that the Kurdish struggle in Rojava in northern Syria was a “beacon of hope” in the Middle East and must be supported. Historian Professor John Tully spoke on behalf of Australians for Kurdistan and provided some essential historical and political background to the Kurdish freedom struggle. He began by drawing attention to the awful recent death of 26-year-old student Zehra Apli, who was illegally detained by Erdogan’s thugs and accused of PKK membership. She burned herself to death in prison. Tully also highlighted the deafening silence from “world leaders” (including the Turnbull government) and the media on the repression in Turkey.